Verdict: 5 years confinement at hard labor/ Sentence upheld by Lt. Col. Allan R. Browne, JAGD because of the severity and brutality of the two remaining specifications for which accused was responsible as a superior. Reviewing Authority's Recommendations: 1. Evidence under specification 4 is "insuffiient to support the findings of the commission." There is no positive establishment of the time when the alleged acts were committed and hence, cannot be conclusive that accused was the commander at the time. 2. Under specification 5d, all of the affidavits except one fails to place the time of the offenses "as during the period accused was in command." There seems to be a misunderstanding about the role of the accused in the camp. 3. Recommended that only 2 years of the sentence be approved, considering the legal failings in regard to specification 4 and 5d. Prosecution Arguments: Evidence under specification 4 is not specific: "it covers long periods of time prior to, and including, the three months that accused was in command, as the time affiants were at the camp and during which time certain incidents occurred." Lt. Hilton being kicked and beaten by a guard in specification 5b was reported to the camp authorities. For specification 5d, there were many affidavits presented by the proseuction. Only a few of the affidavits stated that Commander Hosotani was in charge at the time. Defense Arguments: 1. Claimed that from 1942 he was not second in command but just in charge of prisoners affairs. He received orders in April 1945 stating that he was camp commander. 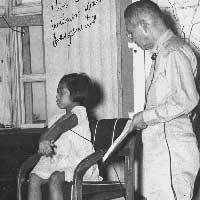 However, since Colonel Kondo's office was in the same building, he had to ask the Colonel's permission concerning most things in administration of the camp. 2. No control over food or medicine distribution: many of their stored supplied were allotted for another branch camp. 4. As camp commander, he had authority to decide whether a prisoner was to be hospitalized or not. 5. He did not see any subordinate officers slapping anyone: if he had, he would have stopped them. He warned and scolded subordinates when he heard of someone abusing prisoners and then reported it to the camp commander. He instructed civilian employees at least once a month not to administer private punishment.